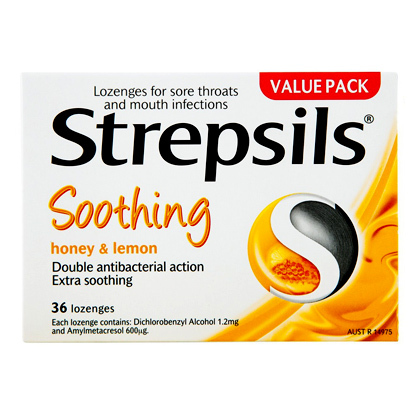 Strepsils® Lozenges contain an effective combination of two bacterial agents to help kill the bacteria which can cause sore throats and mouth infections. Strepsils Lozenges for fast, soothing and effective relief from discomfort. Dissolve one lozenge slowly in mouth every 2 to 3 hours as required. Contains: Each Lozenge Contains: Dichlorobenzyl Alcohol 1.2Mg And Amylmetacresol 600µg. Each Lozenge Also Contains Sucrose And Glucose.